Why do our vanilla extracts taste better? 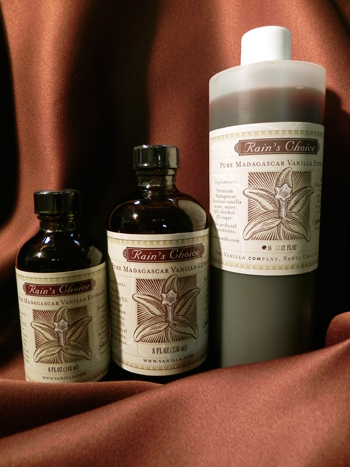 Rain’s Choice vanilla extracts contain 20% more beans than the competition! More beans equals richer flavor! 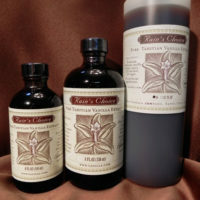 Bourbon Vanilla is a generic term for Vanilla planifolia, and is the most commonly used variety in vanilla extract. Vanilla planifolia stock originated in Mexico, vanilla’s birthplace, but cuttings were taken to other tropical countries in the 1700s. In the 1800s, the French developed large plantations on Reunion, known at the time as the Ile de Bourbon, hence the name Bourbon. Although Bourbon vanilla extract contains alcohol, it is not made from Bourbon whiskey. Bourbon and Mexican vanillas have the familiar vanilla flavor that we associate with vanilla ice cream and other vanilla flavored desserts and beverages. Creamy, hay-like notes, rich flavor and an assertive finish. Use this flavorful vanilla in all your favorite cookies, cakes and pastries. Finish savory cream sauces with a few drops of Madagascar vanilla extract. Add a splash to pork dishes and keep a small bottle available for bar drinks. Think outside the box when using vanilla. It provides a great boost to nearly everything. Add it judiciously and be delighted by the flavor boost! Ingredients: Purified water, sugar cane alcohol (35%), premium *Bourbon vanilla bean extractives. No artificial flavors or preservatives added. Certified Kosher. Non-GMO. Gluten-free. *Due to the vanilla crisis, beans from areas other than Madagascar have been as good as or better than beans from Madagascar. Our Bourbon Vanilla Extract is made from a blend of beans from Madagascar and beans from Papua New Guinea. 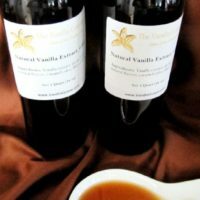 Both are Vanilla Planifolia beans (also known as Bourbon Vanilla). Read these 5 good reasons why buying bulk vanilla makes sense.